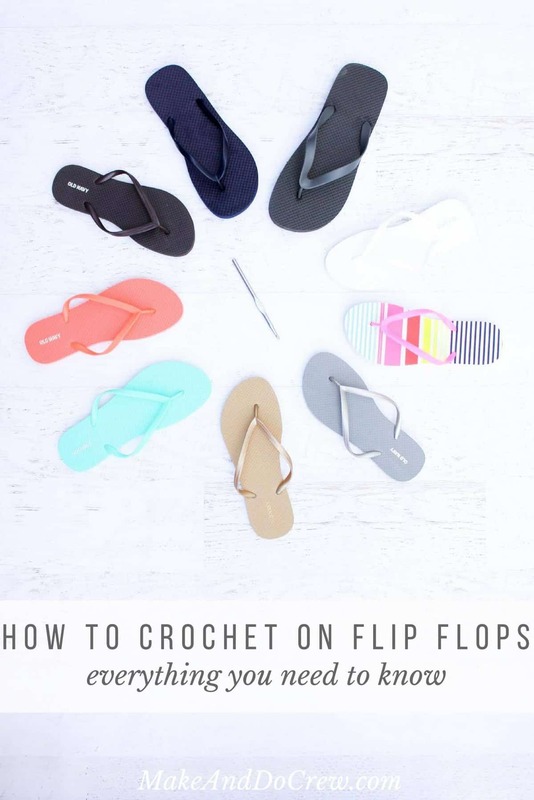 If you’re curious about how to crochet on flip flops, this post will answer many of your questions and give you some helpful tips to get started! 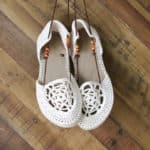 So you can spend more time learning how to crochet on flip flops and less time shopping, this post contains affiliate links at no extra cost to you. 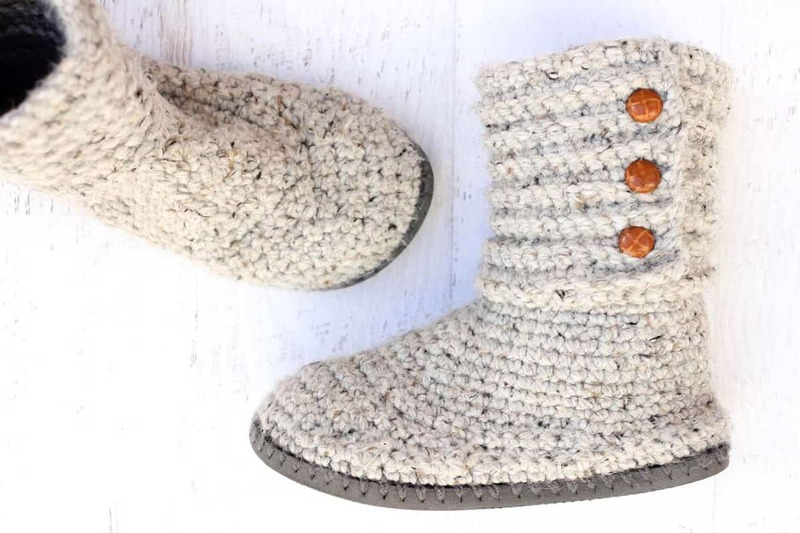 Last week, I shared my free crochet Breckenridge Boots pattern that uses flip flops for soles. 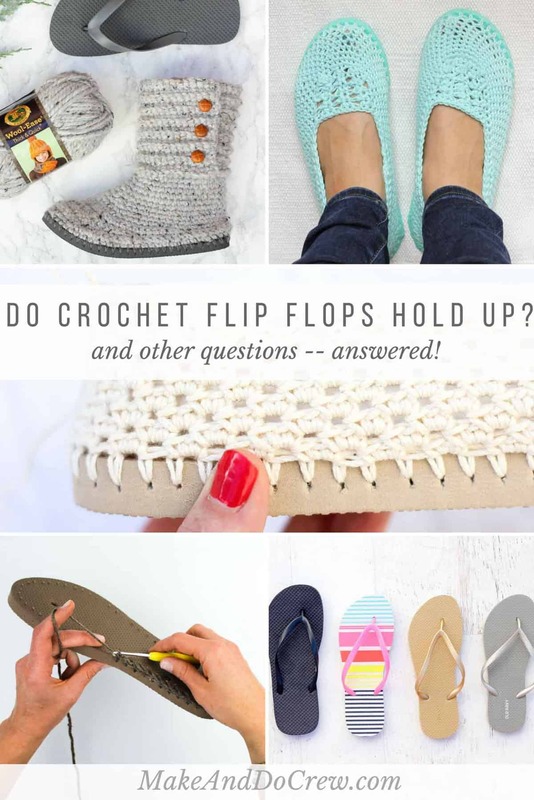 Whenever I design a new patten, I seem to get many similar questions about how to crochet on flip flops and how they hold up once you do, so I thought it might be helpful to answer them all in one place. If there’s something you’re wondering that I don’t cover here, please leave a comment and I’ll update this post with the answer! 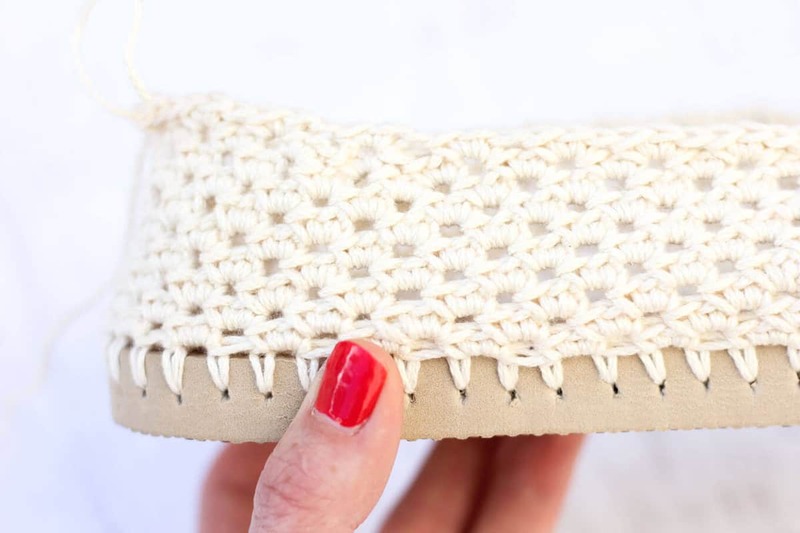 How do crochet shoes with flip flop soles hold up? Does the yarn rip through the sole eventually? This is by far people’s number one question. My experience has been that my boots, slippers and shoes have held up incredibly well. The trickiest part of each pattern is working the first row of single crochet in the holes on the flip flop soles. Once that this finished though, the tension is really evenly spread between the holes, which is what I think makes them durable. Below is a photo of my Lightweight Summer Slippers, which also got about five months of wear before I transitioned to wearing the boots for the winter. As you can see, they’re pretty dirty (thanks for nothing, light blue! ), but the flip flop sole is totally intact and no holes have ripped through the sole. But what if my yarn is ripping through my sole as I work the first row of single crochet? • Check out the next question about where to buy flip flops. 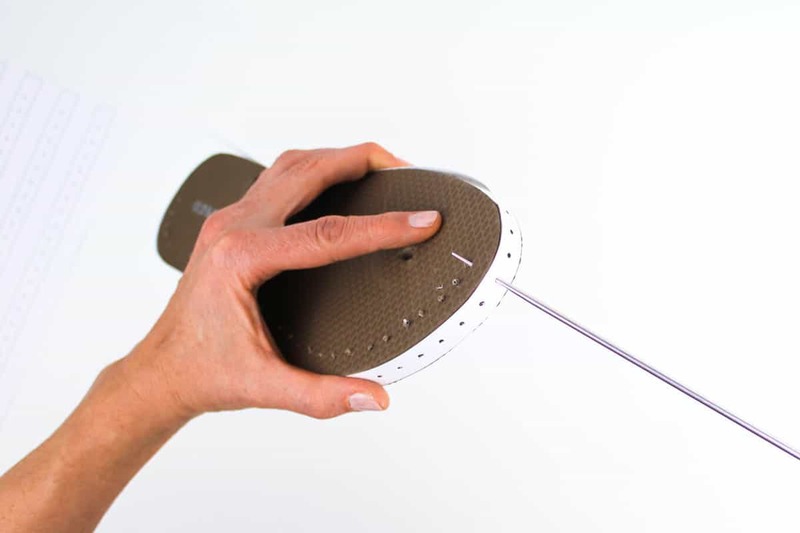 • Poke your holes with the smallest tool you have available. You want to make the least “trauma” to the flip flop as possible so that it is as stable as it can be when you crochet through it. • Use a smaller crochet hook to work the first row of single crochet. I usually use a size B for the first row and it doesn’t rip my holes. I wouldn’t use anything larger than about a 2.25mm hook because it will put too much strain on the holes. Where should I buy flip flops? I’ve tried a lot of flip flops! • Old Navy – a ton of great colors, the quality of sole is good and they are sold in stores year round. (Yay, sweater boots!) They cost about $4, but are often on sale. 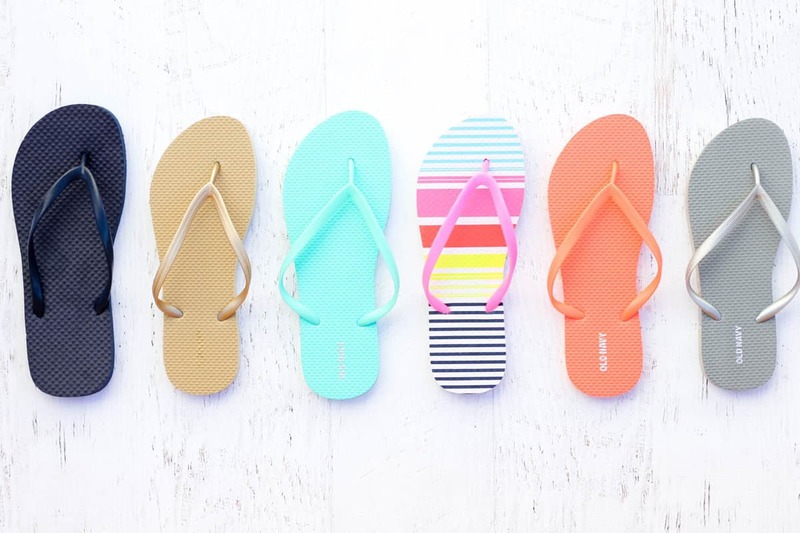 Old Navy has a big summer flip flop event in June where all their flip flops are $1! Stock up! • Walmart – usually only available in spring and summer in stores and online the rest of the year. The quality of the sole is great. Last year, solid color flip flops were 98 cents and ones with a pattern on the sole were about $3-4. • Michaels – great selection of colors in store during the spring and summer. The pair of Michael’s flip flops I used for my moccasins were slightly flimsier than others I’ve tried from different stores. They cost between $2.50-$4. • Amazon – year round selection of great colors for about $1-$7. Great for anyone who hates to shop or who doesn’t live near a store mentioned above. What should I use to poke the holes? I usually use a sharp tool that’s meant for working with clay like this. I’ve heard of readers having success with very thin drill bits as well as awls like these. Can I use something besides flip flops for the sole? Of course! Crochet is one big experiment! I’ve seen readers who have used the soles of worn out Crocs and other shoes. The most important part of executing the pattern is poking the holes the recommended distance apart, regardless of what sole you use. What yarn should I use? Can I substitute yarns? Many yarns can be used to crochet on flip flops, but here are two I tend to use often. 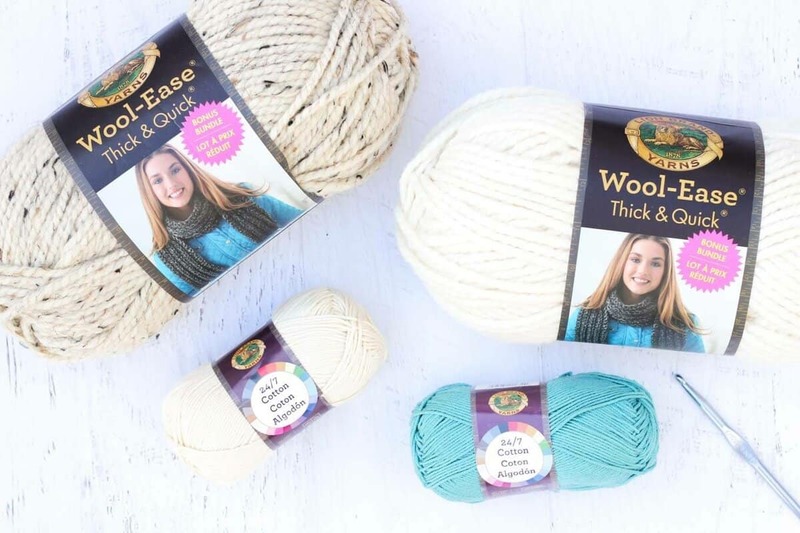 Wool-Ease Thick & Quick is what I used in my Cabin Boots and my Breckenridge Boots. It’s available in a smaller skein and a larger skein and like I showed you above, it’s holding up extremely well in the Cabin Boots. I love 24/7 Cotton for warmer weather projects. It’s mercerized, so it doesn’t stretch a ton and it’s durable and beautiful at the same time. Below, you can see it in action in my moccasins and a new pattern I’ve been working on. In the interest of transparency, I’ll tell you that I do currently partner with Lion Brand, which means I get my hands on a lot of this awesome yarn! Both of these products were my preferred flip flop yarns before I started working with Lion Brand in 2017 though, which made me even more excited to about the partnership. 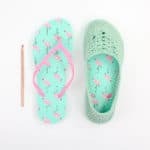 Substituting yarns can become slightly tricky because each pattern is based on how far apart the holes in the flip flops are poked, which is based on the yarn weight and thickness. I do understand some people have allergies, etc, and need to substitute yarns. YarnSub.com is an awesome resource for this. Can I leave the flip flop straps on and crochet over them? Honestly, this idea had never occurred to me until a few readers started asking me about it and telling me they had success doing it. For many of my patterns, especially boots, leaving the straps on should pose no issue. For patterns that are less substantial and more like a ballet flat, you might find that the straps are visible under the crocheting. Do crochet shoes with flip flop soles stretch out over time? I’ve found that my cotton slippers stretch out a bit, but not so much that they’re not comfortable or wearable. It is important to keep this in mind though as you crochet if you’re using cotton so that you begin with shoes that feel snug enough to begin with. I haven’t noticed my crochet boots with flip flop soles stretching much at all. My shoes/boots are turning out too loose as I crochet. What should I do? • Make sure your holes are poked the recommended distance apart. Using the printable guide in the pattern PDF is super helpful for this. If you want to start over, you can try poking your holes just slightly further apart. • Work extra decreases early on in the pattern so that you have fewer stitches overall when you’re crocheting the rest of the boot. • In general, my Breckenridge Boot pattern (pictured below) will fit tighter than the Cabin Boots. Are these going to be comfortable? Heck yes. Like nothing your feet have ever felt. Do you have child’s/men’s/toddler sizing for a particular pattern? Only if it’s listed in the original pattern. I get a lot of requests for different sizing options and try to gauge interest in what the most people want additional sizes in. 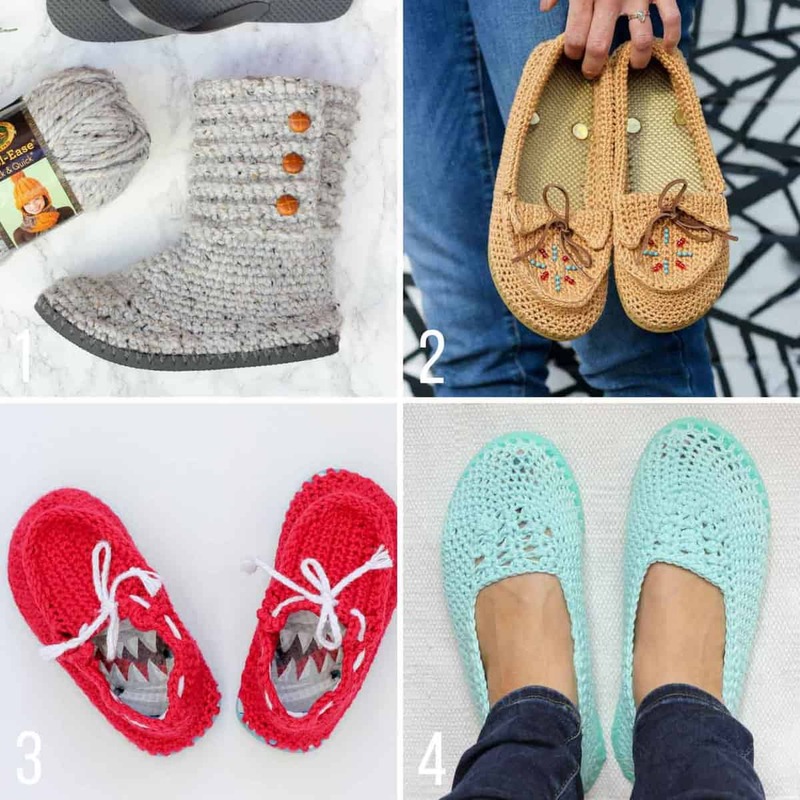 If you subscribe in the box at the bottom of this post, I’ll send you a note when I publish a new flip flop crochet pattern or additional sizes of existing patterns. 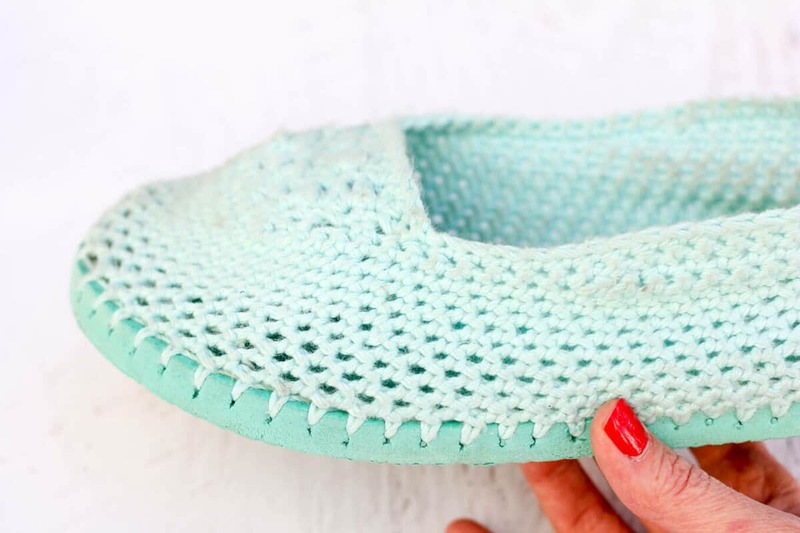 Do you make crochet shoes with flip flop soles to sell? I don’t. I’m a gal who thrives on novelty and thus, I always want to make something new. Several of my readers are Etsy sellers who will customize a pair of flip flop shoes to exactly you’re liking though! Check out Mindy from Loving Lea Created if you’d like to commission a pair. Do you have a knit version? I am working on it! Again if you subscribe below, I’ll send you a note when I publish the free pattern. What did I miss? If there’s anything else you’d like to know about how to crochet on flip flops, please leave a comment below! 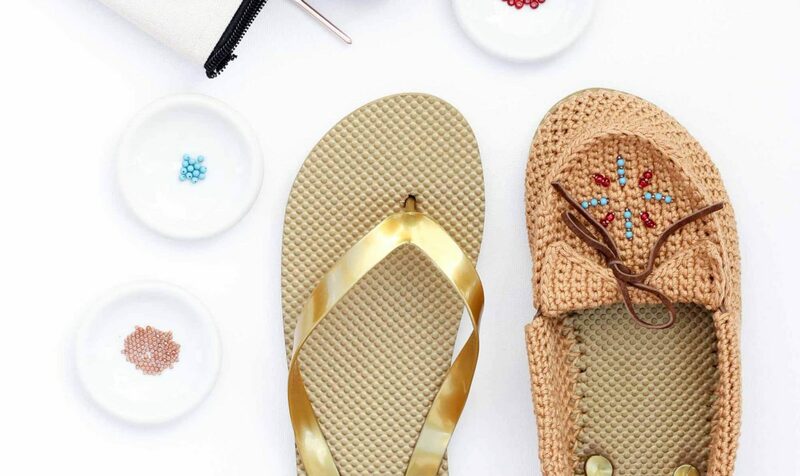 Are you ready to crochet on flip flops!? Here are a few free patterns to get you started! I absolutely LOVE my light weight summer slippers! I made a pair for myself and a friend (my granddaughter wants a pair also). I wear mine so much and they got dirty, so I threw them in the washing machine, i figured if they fell apart I would make a new pair. They came out great! Nice and clean! I didn’t put them in the dryer, I let them air dry. I can’t wait to make the cabin boots, thanks for all the patterns! Yay! I love reading comments like this, Kathy. Thanks so much for letting me know how your flip flop slippers faired in the wash. I’ve been really wanting to try that with mine. I might update this post to include that info because I bet others would like to know too. Please send me your knitted pattern when you have it completed. how do you get the yarn through the punched hole to start with? I love this idea! I actually made a pair 2 years ago before I knew about your pattern. Mine didn’t turn out correctly. They still work though. Now I have a definite pattern, I did mine incorrectly. Thank you for this wonderful pattern design. I love all you tips and tricks, so very helpful, but I would like to say all the text is so light it is hard to read. I adjusted my setting and nothing worked. I’m so sorry you’re having trouble. Do you mean the text of this article? Sometimes when I’m struggling with legibility online, I increase the size of the page I’m looking at by holding down the command key and clicking the + sign a few times. This should work on my site too if you feel like you’d like to enlarge it. I hope maybe that’s helpful! Jess, You can easily enlarge a page simply by holding down the Control / Command key and use the mouse wheel. I had the same trouble. I did make the text bigger but its the lightness of the print that is the issue..not the size of it. There are several add-ons available for browsers that will help with that. They change the contrast on the pages so they are easier to see. I made the slippers for myself and my daughter, and we love them. They are so comfortable that I sometimes forget I’m wearing slippers and I’ve almost gone out with them on. I am new to crocheting so I had a little trouble with the pattern at the toe area so I simply did single crochet back and forth to fill it in instead of the pattern. Thank you for the awesome slipper pattern, can’t wait to try the boots. Haha. I’ve totally done that too. I just start to think they’re part of my feet! I’m so happy to hear you improvised the pattern to suit your needs. I have several more flip flop patterns coming out this spring that I hope you’ll enjoy too! I found that the flip flop soles are uncomfortable because they make my feet perspire. I solved the problem by crocheting an insole with just dishcloth cotton and it works perfect. If you would like a picture or the pattern that I used just email me and let me know. What a great solution! I’d love to see a pic. I’ll send you a note now. I am interested in a knit pattern for the shoes. I have not yet learned Crochet. The article answered my questions. I will be on the lookout for thick soled flip flops. I think that the skills you learn in that course combined with my flip flop video tutorials would give you enough guidance to attempt a crochet pair. And if not, I hope to have the knit version soon! Hi Jess! I think the one thing you missed is how you came up with the idea to crochet shoes with flip flop soles. Also, knowing that you can wear them out and stuff, would it be possible to poke the yarn down to the bottom of the flip flop instead through the side? Would it make it more sturdy or more likely to break the yarn? Thanks! I got the idea for crocheting on flip flops when I saw this really awesome Italian YouTube tutorial that shows the woman crocheting on leather soles. I can’t understand a word of it, but it sure got me inspired to figure out my own techniques, lol. Dear Jess, I love your blog and I love your pattern for the cabin boot. I made nine pairs for Yule gifts for family, friends and me. My only issue is the large boxiness of the foot box of the boot. I saw above about reducing more stiches and using a smaller needle, …any other suggestions? I am not comfortable diverging from the patter with crochet ad I was with knitting, which I stopped years ago. Thanks for saying hello. I’m so impressed by how many pairs of boots you’ve made! One other thing you might try to tighten up the boxiness of the toe is poking your holes slightly further apart so that you have fewer stitches overall. Also, I’m assuming you’re deliberately crocheting pretty tightly. Keeping your stitches tight can help a lot too. If those ideas don’t pan out in the way you’d like, you might try working the bottom half of my Breckenridge Boot pattern and then working the top ankle section of the Cabin Boots. The Breckenridge Boots have a tighter foot section overall and might be more to your liking without tweaking the pattern. If it’s still not working for you, you can send me an email at jess (at) makeanddocrew (dot) com and I’ll add you manually. Thank you for answering all the questions about these “boots/shoes” as I was having my doubts. My Granddaughter wants me to make her a pair of the boots. Guess I’m going to have to start a pair soon. I’m so glad it was helpful, Suzanne. I’ve been so impressed with how mine have held up that I thought other people might like to know too. Can’t wait to see a knit version or the boots! As my partner and I re building a new home, we are making it a ‘no shoes’ home and so I have been using the flip flop sole patterns to make for our guests. They are loved by everyone and I love making them however I make my foundation row in a different way. I do a blanket stitch around the sole, then a loop through the top stitch and join the too loops together with crochet. I have found this to put less tension through the holes ensuring they do not rip. I can send you a photo if you like. I’d love to see a photo! That sounds like a really smart idea, Eunice. You can email me at Jess (at) makeanddocrew (dot) com. Our house is a no-shoes home too, which is why my flip flop slippers are often worn about 14 hours a day! You can get the grey Cabin Boots here and the brown Breckenridge boots here. I made so many pair of these cabin boots this holiday season I could probably make them in my sleep. Lol My niece wanted a pair this Christmas season . SHE STARTED SOMETHING ! My sister put in her order as well as my 4 year old neighbor girl and her brother and mother. My niece wore them to school and her friends made their requests. After 14 pair (no joke) I am finally done and now that everyones tootsies are warm she is into messy bun beanies… Oh boy here we go. I love that she adores homemade things and shares. She is always finding something new for me to make her on make & do. I’m having a ball. My niece shared your flip flop pattern with me, and said she wanted a pair. Turquoise is her favorite color. I live in a rural area…so its a ways to go to get flip flops. The only pair I had was orange…and the only yarn that matched was varigated (orange, yellow, white, pink, and turquoise) Peaches n Cream….I make crocheted pot holders too. The slippers turned out pretty nice. I made my Niece a pair, my sister, and have made myself three pair… white, black, and turquoise. Another Niece wanted a pair of black ones. They make wonderful gifts. All in all, I’ve make eight pairs. My feet are wide….so on the second round of stitches…at the toe, I spaced out 3 increases… also on the third round,…then on. The 6th and 7the rounds, I decreased…this gave me the fullness I needed. Thank you for this wonderful pattern…I really like it. Oh, by the way….I’m 82 years old, and very blessed. Wow, Myrtyle, you have been crocheting up a storm! How wonderful that you share your creativity and love of crochet with your family. I have loved making these flip flop patterns and it makes me so happy to know you’re enjoying them too! I have made several pair of slippers with flip flops and love each one. But I use a paper punch and punch my holes through the whole sole it so much Easyer and fast to do! I have never had any problem with my yarn braking away! Thank you for the free patterns, they make wonder gifts that are made with Gods Blessing, for if it was not for the blessing of my hands I would not be able to make them!!!! Your hands are a definite blessing, Sue! I think that about my hands every single day too! We’re so lucky. That sounds like a really intriguing idea. Do you mean the kind of paper punch that you’d use to make a hole in paper for something like a 3 ring binder? I’d love to see how that works! I’ve made two pairs of your moccasins. The first pair was made according to your directions. I thought it was hard to work around the sole though. So, for the second pair used a marker to dot where the holes would go and then counted them. I then made the entire side and top of the moccasin independent of the sole by starting with that counted number of dots. I then used a sharp craft needle to sew the completed moccasin to the sole. Not only did I find the project easier to work but it also went much faster. Sounds like a great idea, Linda! This is the approach I’m taking with making a pair of knitted shoes with flip flop soles. I hope it works out as well as your did! I looked for the free written pattern and cannot find one. I made one par of slippers fro the video and on my second pair. Would like a written pattern but can’t find one. Thanks for the tutorial! How about the circles that are filling the hole in the bottom (after straps are cut)? Do they fall out? Do you glue them in place? Yes, I’ve glued them in place with something like E600 glue. I’ve actually found thought that I prefer to leave the back plugs in and just cut the straps off at an extreme angle so I don’t feel them in the shoe. You can see an example in my Coachella Boots pattern. Then I glue the middle plug that goes between your toes back in as usual. Great–I’m glad you found a way that works for you, Ann. I am paralyzed from the chest down and am so excited about making my own boots. I would like to start with the slipper boots but wear two different size shoes. I got kids flip flops, the right size large and the left size medium. Can you tell me how many holes to put in each and the distance between the holes? I would love to do the holes tonight. Thanks! You can find all my printable pattern pdfs here. They’re $2.50 each. So,I bought the yarn and other supplies you recommended, and my yarn is so much bulkier than yours. I made one cabin boot, and it’s much taller and bigger than it should be. I don’t know how to post a photo. I’m not sure what to do. This boot is huge! If you used the exact same yarn as me, I’m wondering if maybe you crocheted a bit looser than I do? Did you use the hole poking ruler in the printable pattern? That’s pretty helpful in achieving the gauge. Also, these are intended to be crocheted similar to amigurumi, so really pretty tight. You might consider sizing down your hook to help you crochet tightly. Interested in a knitted pattern when available. Thanks for your purchase! I haven’t tried hot glue, but I do wonder the same thing about it melting the sole. I’ve found that if you cut the mid-sole straps at an extreme angle (as pictured in the pattern instructions), you won’t even feel them and you can just leave them there. Then I use a really strong glue, like E6000 to glue the toe plug back in at the end. Hi, I would like to know if you leave the rubber/plastic tabs on the soles, if so, is there a way (if you know) how you can remove these? Do you mean the little “plugs” that are left when you cut the straps off? If so, they’re actually pretty easy to just pop out through the foam sole. That’s what I did on my first few pairs and it works great, especially if you just intend your shoes to be inside slippers. Really enjoyed your tutorial. Thanks for the inspiration. Gotta try it. Thank you Marsha! So happy to hear this was helpful for you! I’d love to hear if you decide to make a pair! Am interested in the knitting version when available. Thanks! Thanks for letting me know, Patti! Thank you for sharing your creativity–all of these shoes and boots are SO CUTE! I would love to see a knit pattern since I much prefer to knit. These are all so adorable I will, however, have to break out my crochet hooks and get started on these. ? Thank you for the patterns!! I’m working on a knit version. It’s just a little trickier to figure out because of the needles, etc. Thanks for this! I have a pair of old shearling boots that the soles crumbled and broke off. I was trying to figure out how to fis them. I think I will “re sole” them with flip flops to wear as slippers! That sounds awesome, Jane! I love being able to recycle things like that. Before Christmas I found your pattern for the Cabin boots! Just loved it… so I made them. Unfortunately I don’t think they turned out. First thing I noticed was that all the side picutres of the boots show the toe as curving up ward but mine never did that and the toe itself just seemed too big and bulgy. You’ve answered the question of watching the tension and incorporating more decreases in the section about “too loose” above. but should the toe just naturally curve up? or am I missing something? I hope that’s helpful! Happy crocheting. Hi…I was wondering whether it’s ok to poke the holes with a knitting needle…? (What a beautiful name, btw!) I think it depends on how thin your needle is. Most size needles will be too thick. If you have something like a very thin awl or even a wooden skewer, like for shish kabobs, I’d try that first. Serendipity–after seeing you making the moccasins, I was at a rummage sale and found two old ice picks, and thought to myself, WAAAAAY COOL! they look perfect to punch the holes in the flip flop soles. I’m waiting for some cotton yarn to be delivered, but I was wondering–could I add a thin elastic in the top two rows? I LOVE those serendipitous thrift store and rummage sales finds! They’re my favorite! Yes, I think you could definitely add some elastic if you’d like, although I’m not sure it would create a stretchy edge (just because of the cotton being less stretchy). The leather lace is pretty effective at keeping the shoe on your foot though and you can always tie it tighter if necessary. Hola! Ahora si, aclaradas todas mis inquietudes. Voy a ponerme manos a la obra y quiero hacerme un par de botas. Muchas gracias por ser tan generosa compartiendo tus saberes. Cuando tenga listo mi primera obra te mando foto. Besos y bendiciones! Muchas gracias, Maricel! I hope you love your boots as much as I love mine! 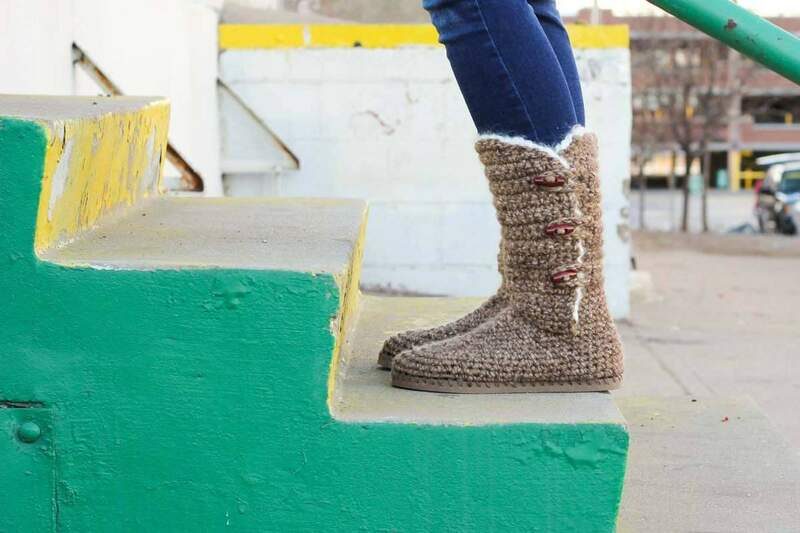 I would love to see a knit version of you flip flop moccasins and cabin boots. Love your website and all the fun patterns you create! This project will be for my Christmas list. Thank you. It’s a marvelous idea. I made the moccasins, it took three tries to get them looking like your picture. After they were finished my foot slid forward passed the flip flop and the toe eventually (after about 4 weeks) wore a hole in the yarn. I tried smaller flips, larger ones and even place theholes closer and then farther apart. Nothing works. Any suggestions??? I appreciate all your experimentation! These flip flop shoes can def be an experiment. Can I ask what yarn you used? I haven’t had my yarn get a hole in it until about a year of wear. I’m wondering if that first pair the flip flops were a bit too big and that’s why your toe slid forward? With smaller flip flops and tight stitches, I wouldn’t expect your toe to slip forward. And I think avoiding having your toe hit the ground when you walk will help keep your yarn safe longer. I hope any of those thoughts are helpful! This is a great! I can’t wait to try them. Could you please send me your knit pattern when it is available? I crochet but like to knit more. Thanks. Hello from Colorado! 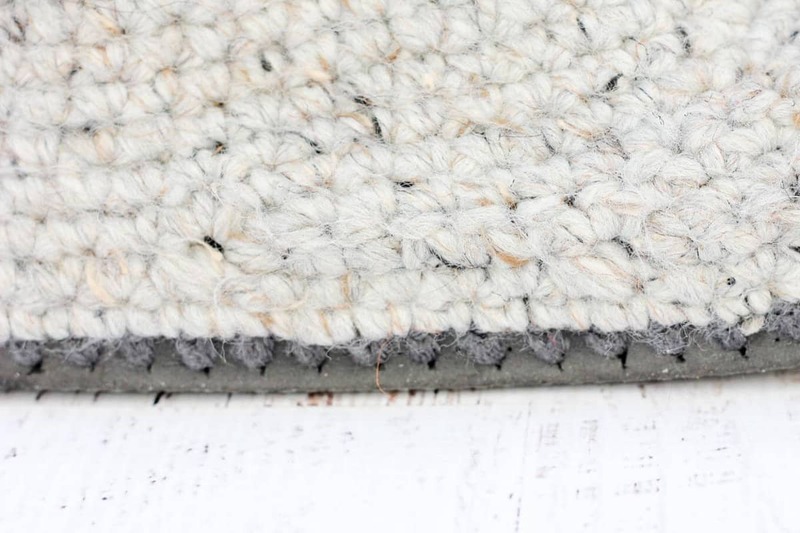 I’d look for a cotton yarn that is mercernized if possible. The yarn I used is slightly lighter than a worsted weight, so if you could find something like a DK weight or light worsted weight, that would work well. hi, a friend wants me to make the boots for her. so i thought i would have a go at making the slippers for myself first to get my confidence up and because they are a smaller project. I am a size 6. she is a size 7 so i am assuming I will need to use a smaller hook for myself. Anyway, If I buy the pdf version for the slippers is the hole marker the same as the one in the boot pattern please so i dont need to buy 2 patterns? many thanks for your time. Hi,I stumbled across your article on Pintrest. I would love to know when you come up with knitting patterns as I haven’t crotchet in about 30 years. I am a size 8-8.5 but I know many people who would be interested in these so if come up with the pattern with various sizes that would be most appreciated. I found your article through Pintrest. I knit,haven’t crochet in 30 years. Size 8-8.5 however if it includes multiple sizes that would be greatly appreciated. Welcome! All of my flip flop patterns include multiple sizes, usually about women’s size 5-10 or 11. How do you plug the holes in the soles of flip-flops after the straps are cut off? What do you do about the holes that are left in the soles where the original straps were cut off. Are they filled with something or just left open? I like to glue the “plugs” from the straps back in. I made myself a pair of slipper socks this winter and would love to be able to wear them outside. Do you have a way to add soles to a completed project? I debated gluing them on but thought that might not work… TIA! I look forward to making some of your patterns for next winter. That’s such a wonderful idea. Crochets on a flip flop, are they common? I mean I have heard about this first time on this article but tbh they look really cool to wear. I’ll try making my flip flop crochet soon.